Why Choose a Window Sign? As Autumn slides into Winter and the clocks go back I remember why windows are so great. The days are getting shorter and dusk falls in prime commuting hours; during the short period of time when people switch on their lights but have not yet drawn their curtains. Sitting on the train or bus at this time of year, most of us will have idly but nosily gazed into the household windows that our transport whistles (if we’re lucky) past. This very human habit is reflected commercially in the tendency of consumers to linger outside a warmly lit shop window on a murky Winter evening. The glass and windows of your business offer a visual passage to the core of your offering, and an opportunity to reinforce your branding. Outside, customers can browse a shop from the distance of the street; inside, colleagues can peripherally keep in touch with the action of other parts of the business. There is a reason that most modern offices choose to have glass fronted meeting rooms and reception areas. So what is it about glass that is so appealing and versatile? Frosted glass used in meeting rooms, windows or dividing screens allow light to pass through whilst retaining the privacy required for business meetings, pitches or interviews. For business fronts, full colour graphics can block some visibility from the outside, providing privacy to the business workings behind closed doors. Visibility can evoke a feeling of trustworthiness in a business, and a glass frontage is the pinnacle of this. A favourite among estate agents or entertainment venues, cable and rod displays can present a vast quantity of information to your customers. By going a step further and using light pockets in the display, each piece of information becomes framed. Graphics printed onto clear backed vinyl turn a window into a work of art! Your choice of design and style can cover all or part of your business or shop front to bring a unique designer style to your business. If you have glass panels, construct your image piece by piece using smaller graphic designs. Simple bands of frosted glass at certain heights ensure privacy while creating a contemporary contrasting look. More elaborate profile cut or reverse cut etch graphics on a window or branded business sign are an extremely attractive and contemporary choice of signage. 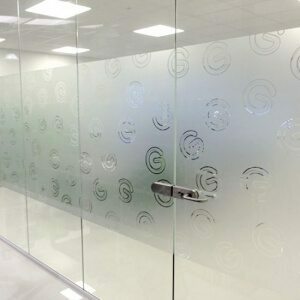 It is possible to achieve a surprisingly high quality of detail in etched glass signage and this technique can accurately reproduce your logo, or attractively frame your window display. Depending on the location of your glass, decals at certain heights can be a legal requirement. In fact, it can change its look entirely! dow can change both its look and its function. 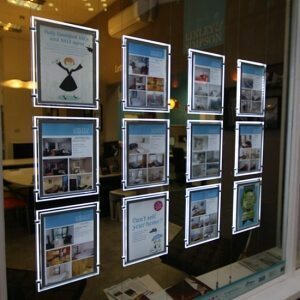 Use vinyl to publicise an offer by filling your entire window with an image, or simply display up to date opening times or door instructions. 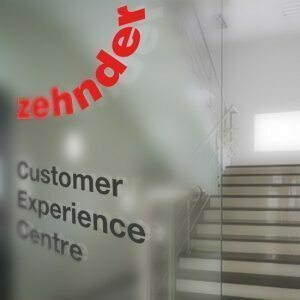 Signage using glass is extremely flexible in its uses, themes, trends and styles.From intricate etch effects and translucent vinyl graphics to full colour graphics, your windows can be the key to your brand.